Description: Baltic Brown granite is a Commercial name for a brown-black granite (Rapakivi) with spherical shaped brown potassic feldspars of the Precambrian period. This stone internationally may be nominated as a granite and in the area of application of the European Standard this stone must be nominated as granite. During the polishing process a clear epoxy resin filler may be used to fill any micro fissures or tiny pitting however this does not affect the integrity of the stone, it merely provides an even smoother surface finish. Baltic Brown Granite is suitable for both interior and exterior use futhermore is frost resistant and with a constant polish. 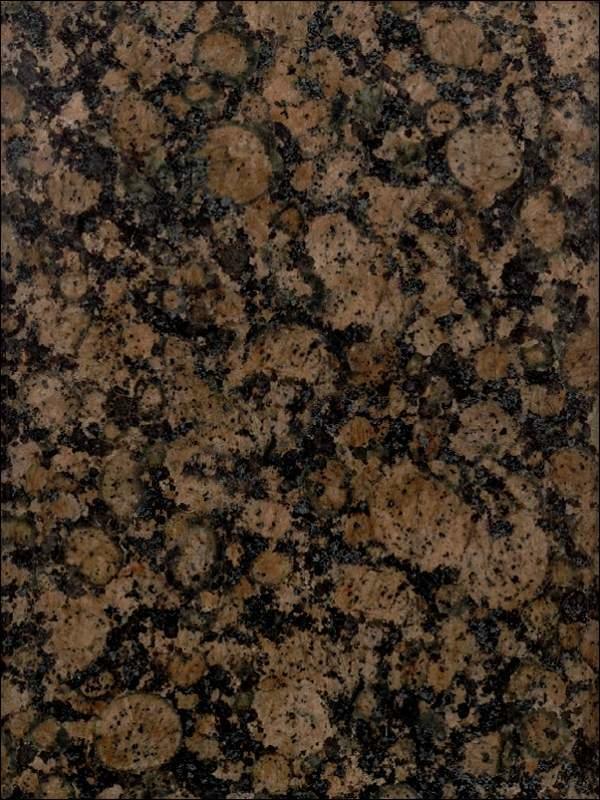 Surface Finish: Baltic Brown Granite looks best with a gloss polished surface but is also available as honed, leather/satin, river-washed/antique, thermal/flamed, brushed and sandblast finish. Sealing: Test with a small sample. It is most unlikely that a sealant can be used on Baltic Brown granite due to the grain formation, attempts at sealing it could actually create a residue film build-up. Block Sizes: There are several different quarries of Baltic Brown granite ranging from light to dark and with differing background colours however all quarries yield selectable, grades of granite with blocks suitable for gangsaw size down to economical tile-sized blocks. For commercial projects it is important to ensure that blocks are selected from the same quarry face. Quarry Location: Baltic Brown granite is quarried near Savitaipale, Ylaemaa, Husu, Leppeeranta, Miehikkaelae, Finland, near to the border with Russia. Synonyms: Baltic Braun, Baltic Brovn, Baltic Brun, Baltik Braun, Brown Baltic, Bruno Baltico, Castanho Verdoso, Coffe Diamond, GA 501, Kugelgranit, Marron Baltico, Marrone Baltico, Rapakiwi-Granit, Ylaemaan Ruskea. Rapakivi Granite: A hornblende-biotite granite containing large rounded crystals of orthoclase mantled with oligoclase. The name has come to be used most frequently as a textural term where it implies plagioclase rims around orthoclase in plutonic rocks. Rapakivi is Finnish for "crumbly rock", because the different heat expansion coefficients of the component minerals make exposed rapakivi crumbly.